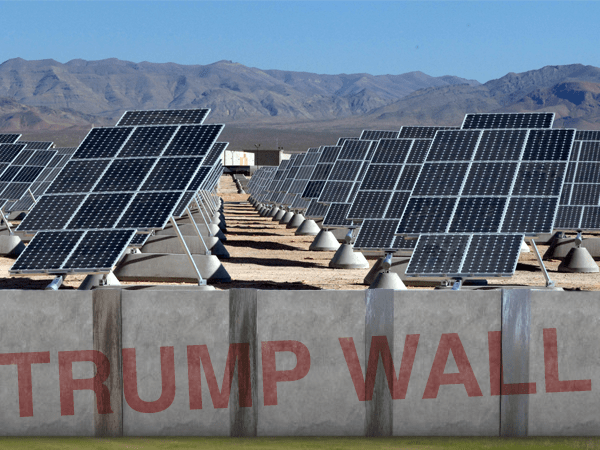 Donald Trump’s border wall is gaining traction thanks to a revised proposal that would outfit it with solar panels. Detractors are turning into advocates, and the new plan may even have a hidden benefit for a few savvy folks out there. Why does Trump care about making his border wall solar? Essentially, he’s dangling a huge carrot in front of Democrats, environmentalists, and other staunch opponents of the original plan. And it looks like it may work. By offsetting construction costs, promising renewable green energy, and assisting rural communities on both sides of the border, Trump’s new plan for a solar border wall could soon garner some strong support. Trump’s border wall has evolved significantly since he first mentioned it on the campaign trail. Originally, he wanted a conventional barrier stretching approximately 2,000 miles — spanning the entire border from the Pacific coast to the Gulf of Mexico. But the most recent proposals look entirely different. Congress is forcing Trump to pare down his initial request. Now, it appears the wall will be built in small installments, starting with 60 miles throughout South Texas and San Diego. However, whatever Trump concedes in length, he’s hoping to make up for in height. And solar energy is his means of justification. “The higher it goes, the more valuable it is,” Trump said. On average, a solar panel requires ⅔ an ounce of silver. That might sound small at first, but when we consider the size of the silver market, current spot prices, and the enormous demand that would be generated by Trump’s wall… we can see a tremendous opportunity. A typical commercial solar panel is 39 inches wide. That means it would take 97,477 panels to reach across Trump’s first 60-mile wall. But remember, the wall is going to have five vertical tiers of solar panels. So when we take that number and multiply it by five, we get a whopping 487,385 panels. That comes out to 326,548 ounces of silver, and just for the first 60 miles of wall. If Trump succeeds in building the remaining 2,000 miles in similar fashion, we’re looking at 11 million ounces of new silver demand. This is what future silver demand could look like, but what about the supply side? Silver mining trends from recent years put everything into perspective. As recently as 2014, the U.S. mined only 17% of the silver it used, with the rest coming from imports or recycling. In other words, mining productivity within the U.S. couldn’t keep up with current demand. On top of that, global silver mining production started falling dramatically in 2016, for the first time in 14 years. This means the enormous demand for silver from Trump’s new border wall plan is coming at a time when supply of new silver is experiencing a notable contraction. What do you think 11 million ounces of new demand will do to silver prices at a time like this? Even if you hold a traditional 401(k) or IRA, there is still a simple way to prosper from this emerging opportunity in silver: Convert your retirement account into a “Self-Directed” Precious Metals IRA. It’s an easy process that lets you allocate a portion of your savings into real, physical silver and gold. The conversion won’t expose you to extra tax liability, and you can still invest other types of assets within your retirement account. The silver market is relatively small. It doesn’t take much new demand to push prices higher. That said, Trump’s solar border wall could be the biggest surge in silver demand we’ve ever seen. Act now, before construction starts and while silver prices are still low.